Footpath into Ancient Turkey – the Carian Trail. Long-distance paths. Now aren’t they a particularly British thing? Not really. France has a most intricate spiders web of ways, the Chemins de Grandes Randonnées, threading throughout the countryside, marked with regular flashes of colour painted onto rocks, on buildings, posts, or anything that stays still. Spain draws the various converging arms of the St James pilgrimage way together for its conclusion in Santiago de Compostela. Switzerland probably beats everybody, with its meticulous system of integrated walks and cycle routes throughout the countryside, linking up to stations and bus stops. The British system, marked by more formal signposts, is still wonderful, with a world class Premier Division of long-distance trails weaving around coastline, leading up the spine of England in the Pennine Way, and linking places of great history, Winchester to Canterbury for example. So it was a delight, and a surprise, to find this great ambulatory ambition extended to Turkey. Several long-distance paths have already been established during the 2000s. I found the newest one. When should you walk it? It isn’t difficult to work that out. On some national trails in Britain you would do well to study the weather forecast closely before setting off, at almost any time of year. In the winter it’s almost obligatory. You would never want to hazard the Pennine Way in December when there’s the risk of a blizzard. Weather warnings in Turkey in the summer are hardly necessary. I stayed within a few meters of the new Carian Trail, which meanders around Southwest Turkey, in July this year (2013), and I didn’t need a thermometer to tell me that walking at any time between 9:30 AM and 4:30 PM would be, put simply, mad. Unless I found one of the deeply wooded streches high on the mountains in the Loryma Peninsula. If you are an early riser on holiday, however, walking can be blissful. The pre-dawn hour in the Turkish summer is a wonderful time, with a golden-creamy light, when the slightest countryside sound carries far in the still, syrupy air. In Britain, one person’s long-distance trail is another’s short hike, and it’s the same in Turkey. 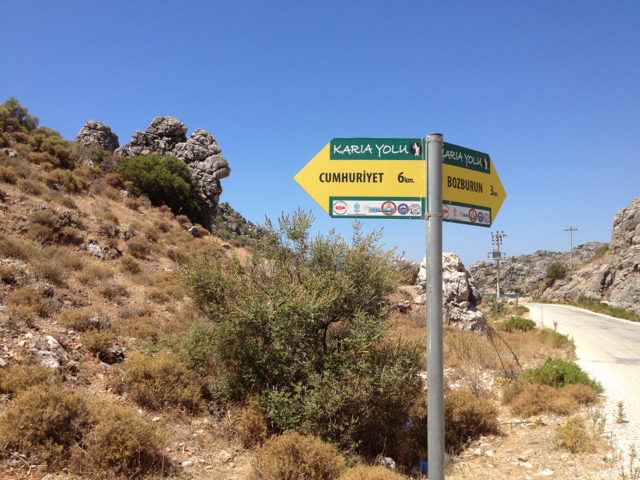 The Carian Trail is 800 km long, but you can walk as much or as little as you like. I settled for a few small stretches around Selimiye, Bozburun and Söğüt on the Loryma Peninsula. It was easy to find even without a map. In Selimiye an obliging bright yellow sign points to a narrow path up into a typical hillside cloaked in the ubiquitous and abundant Mediterranean scrub. It’s wise not to walk it in sandals and shorts. This generally no more than knee-high shrubby vegetation is the Turkish equivalent of the French garrigue, or maquis. It’s known as phrygana in Greece – I haven’t been able to discover its Turkish name. It’s equally ferocious in any language. There’s no danger of finding mud in the summer, but the standard rocky path needs the underfoot security that only stout boots can give you. I found two more tantalizing points of departure. On the quiet track from Bozburun to the village of Söğüt is another yellow sign post. This is quite a challenging path, leading directly up and then over a steep hill, from which the reward is a sumptuous view of the quiet bay at Söğüt, a fine example of the small seaside villages, still little-developed, around this area of coast. From here the path continues directly through the kitchen preparation area of the Octopus Restaurant, and then skirts a simply sublime length of twisting coast of headlands and bays for several miles, passing Byzantine ruins built on Hellenic foundations, and much older remnants of the Rhodian Peraea, 2300 years old and more. With a red and white flash painted on an unmovable stone every 50 meters, staying on the route is easy. To find anywhere, even relatively, cool on this walk in July, you must head up in the pine forests, still abundant on the peninsula. On the high road between Bayir and Osmanye I saw another of the distinctive yellow signs, tempting me to plunge into the woods, where the air is as pure as anyway in Turkey. I’m saving it for another visit. The most important thing you can carry is a bottle of water. Stop gap sustenance is in front of your eyes, hanging from one of the most useful trees in these parts. I often chew on a carob pod. High in carbohydrates, the carob has been a local convenience food for millennia, the most important source of sugar (apart from honey) before sugarcane and sugar beets. But beware those teeth shattering, hard as steel seeds. The Carian Trail is named after the civilization which dominated this region between the 11th and sixth century B.C. The Carians lived in southwest Anatolia and left their mark along the shorelines of the Mediterranean and the Aegean seas and on some Greek islands. The Carians reached their apogee during the rule of Mausolus (377-353 BC) in whose name one of the seven wonders of the ancient world, the Tomb of Mausolus, was built. The trail has as epic a setting as many a British counterpart. This path begins north of Mugla, close to the the site of the ancient city of Alinda. It runs past Lake Bafa, a reserve bird, and skirts the site of the 8.500 years old cave paintings, the Dancers of Latmos, in the Beşparmak Mountains. The route follows the eastern shores of Gökova Bay down to the Datça Peninsula, as far as to Knidos then passes Bozburun and on to Loryma. After wandering around the peninsula, past random Byzantine and Greek remains, a few scattered columns here, the frame of a squat, 1200 year old building there. The trail takes a pause before Marmaris, missing out the heavily built up tourist town, and picking up again for the final section around Dalyan, close to the main airport at Dalaman. owner. Yesil Ev, available through Airbnb, is only a few metres from the Carian Trail, on a section of the path, leading, from Bozburun, directly up and then over a steep hill, from which the reward is a sumptuous view of the quiet bay at Söğüt, a fine example of the small seaside villages, still little-developed, around this area of coast. ‘Yesil Ev’ means green house in Turkish; the hotel comprises four traditional stone villas tastefully renovated using a green philosophy of employing local labour and materials. The place is ideal for people who want to make short and comfortable forays on the Carian Trail, on the edge of the Agean Coast just before it merges into the Mediterranean. Yesil Ev (can accommodate from two to twelve people – prices are inclusive of breakfast as well as afternoon tea and cake). Previous PostShrewsbury, birthplace of Charles Darwin – handsome border outpost	Next PostWhich football club tops the green league?